I can remember the taste of a cherry Popscicle, mingled with chlorine from the pool water that dripped from my hair to my lips. It was the taste of summer, and it was delicious. Summer was flavored with more than the synthetic fruit of the icy treat, of course. Summer meant no school, blinding hot heat and camp. About midway through summer, I’d forget the summer was going to end, until it was time to get new shoes and notebooks for school. Everyone knows that feeling, wishing you could somehow put on the brakes, at least slow the speed, so that the first day of classes wouldn’t arrive. This year, I’m feeling that more acutely than I have since I was a child. Maybe it was all the rain that Irene brought, or the tree in our neighborhood prematurely turning red. It seems like the fall started its push early. Or maybe it’s just that this year, for the first time in a long time, I got to go to camp. In July, I, my husband, Avrom, and several of our friends took the opportunity to spend a Shabbat at Camp Ramah in Nyack. Our sons all were working at the camp as CITs (counselors-in-training, for those of you who have never been in the camp loop), where they spent the days tending to campers from kindergarten through middle school. In the evening, unique to this day camp, the counselors remain in residence in a rarified world of young adults living ruach-filled Jewish lives. There are study sessions, but there’s also a lot of hanging out, going to movies or the mall, and just enjoying each other’s company, all done in their own after-hours camp setting. We arrived at camp and were shown to our stately accommodations, a mattress on the floor of Beit Cochavim, the bunkhouse used for the youngest Ramahniks. Cochavim means “stars” and it is a small, but telling detail that the camp dubs its littlest ones this way. Because if we are to “teach this diligently to our children,” as the V’ahavtah reads, then the receivers of our teaching most certainly are our stars. My son, Nathan, was a CIT for one of the bunks in this edah, or tribe. In our room, I saw a picture of him with his co-counselors standing behind a line of goofy little boys, all of them wearing matching red Cochavim shirts. It wasn’t so long ago that my son was one of the goofy little boys standing in front, with some other parents’ teen standing behind, trying to keep a straight face as he corralled them for a photo op. As a counsleor, now, Nathan would come home on Saturday nights to get “real food,” a comfortable bed and to do laundry the next day. I loved hearing him talk about the little boys in his care. This one was homesick and tried to run away. Another was always tripping over his own feet. But in the end, they all became good campers. 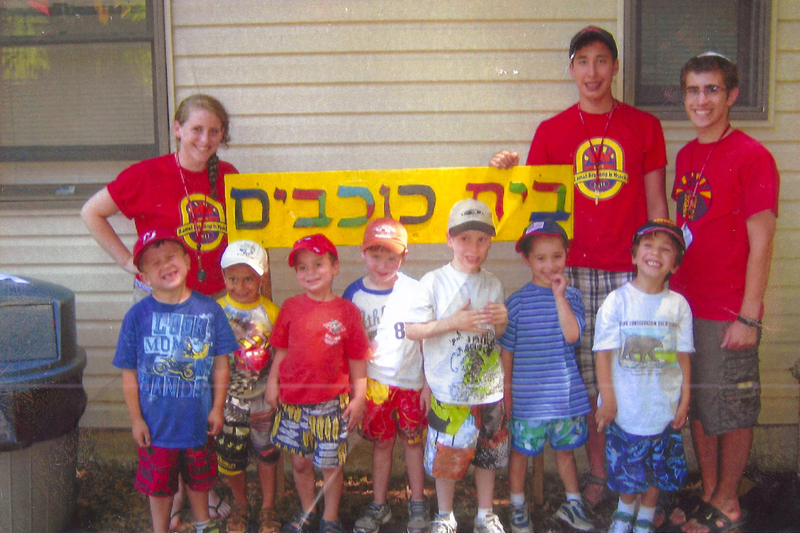 Not so long ago, that was Nathan and his friends; one day, hopefully, some of his campers will be giving another generation of children a great camping experience, filled with a love of Judaism and just plain fun. We began Friday night with services. Kabbalat Shabbat was ascendant; the sound of the counselors’ voices blending in beautiful harmonies through the fluid tunes of the service that brings in Shabbat. After the evening service, we had dinner, and more singing. The CITs take it in turn each week working as waiters, serving their peers at the table. It was crowded, the food was, well, camp food (though pretty good compared to camp food I’ve had in the past) and the spirit was enormous. I went to sleep thinking there was something amazing in the camp water. The next morning, early before breakfast where you fend for yourself, and Shacharit services, I ran with my friend Lou down to Nyack Beach State Park and back. It was already hot, and Christian Herald Road, where the camp is located, is a steep hill, easy to descend, but not so fun on they way back. Morning services were again expertly run by the counselors. The camp is wise enough to let us visiting parents shep nachas, as we watched our kids take part in the service. They also gave us the kavod, or honor, of participating ourselves. After lunch and more singing, time seemed to stand still. We swam in the pool, within the camp’s eruv, later in the day. Mostly we hung out with one another, walked around the camp and enjoyed a day of real rest and separation from the outside world, as Shabbat lingered on. We ended, gathering again for services, a break for seudah shlishit, the traditional third meal of the Sabbath day, and more singing (there’s a theme here, and probably a whole other column about the human voice). We gathered to discuss some text as darkness fell and Shabbat left us. As the stars came out, we performed the havdallah ceremony, saying farewell to the day of rest by candlelight, just as we’d welcomed it in only 25 hours earlier. It is no accident that Amy Skopp Cooper, director of the camp since 1998 and assistant director of the National Ramah Commission, was recently awarded a prestigious $36,000 Covenant Award for excellence in Jewish education. As assistant director of the commission, she brings her vision to a network of eight overnight camps, three day camps and camping programs in Israel. As director of Ramah Nyack, she lavishes as much love, care and attention on her staff — who are trained not only in how to handle their campers, but also in how to be role models for them — as she does on the young children who are their charges. As we move through the month of Elul, the High Holidays approach. Many of us will go to synagogue. Some of us only go at this time of year. Clearly, something beckons to us all, to be together and to seek community on a different sort of scale. My children found that long ago. Camp Ramah helped them find a Jewish way of life that is entwined organically into their daily ones. I never thought it would give me this gift, too.